308 pages | 28 B/W Illus. While numerous advanced statistical approaches have recently been developed for quantitative trait loci (QTL) mapping, the methods are scattered throughout the literature. Statistical Methods for QTL Mapping brings together many recent statistical techniques that address the data complexity of QTL mapping. After introducing basic genetics topics and statistical principles, the author discusses the principles of quantitative genetics, general statistical issues of QTL mapping, commonly used one-dimensional QTL mapping approaches, and multiple interval mapping methods. He then explains how to use a feature selection approach to tackle a QTL mapping problem with dense markers. The book also provides comprehensive coverage of Bayesian models and MCMC algorithms and describes methods for multi-trait QTL mapping and eQTL mapping, including meta-trait methods and multivariate sequential procedures. This book emphasizes the modern statistical methodology for QTL mapping as well as the statistical issues that arise during this process. It gives the necessary biological background for statisticians without training in genetics and, likewise, covers statistical thinking and principles for geneticists. Written primarily for geneticists and statisticians specializing in QTL mapping, the book can also be used as a supplement in graduate courses or for self-study by PhD students working on QTL mapping projects. "This book can be very useful for young researchers working on QTL mapping analysis. No a priori training in genetics or statistics is required." "… a good reference for advanced graduate students and researchers working on statistical genetics research. 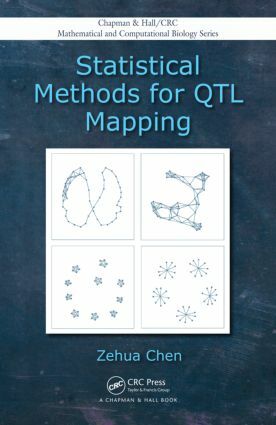 … The book can be used as an advanced reference tool or to supplement a textbook … I found the book’s discussion of various techniques and analytical tools in QTL mapping particularly appealing. The book is unique in terms of the breadth and depth of its statistical treatment in QTL mapping. … The author also provides R code. … Researchers working in statistical genetics with a particular focus on QTL mapping will find this book valuable. It can also help researchers working in other fields to identify potential research topics and begin working in this exciting field." "… the clear writing style and careful development of ideas by the author make it possible to understand the gist of the theoretical aspects of statistical methods for QTL mapping. … important background knowledge and theoretical elements are clearly explicated. Also, the book spends a substantial part on explaining the estimation algorithms for presented methods; readers who are interested in developing computer codes related to the methods can benefit from the book. … good study material for a graduate course on advanced quantitative genetics. … the book is a useful addition to the field of quantitative genetics and can help students and researchers to understand the advanced statistical methods used for QTL mapping."